Santa Cruz Skateboards, the legendary California skateboard company that has been making quality skateboards for over 30 years is back with the Santa Cruz Tiger Shark Skateboard. The Santa Cruz Tiger Shark Skateboard is a cruiser, with a long base and a shape that harkens back to when skateboarding was in its infancy, and skate parks were merely a ramp that a friend built in his back yard or an unfilled in-ground pool. With this latest offering from Santa Cruz Skateboards, you will be surfing on an ocean of asphalt in absolute comfort. This is another great offering from Santa Cruz Skateboards that probably has the biggest innovation skateboarding has ever seen since the kick tail was invented: A built in bottle opener right into the deck. It might seem like it is an unnecessary gimmick, and maybe it is, but it is really cool, and goes great with the tiger print graphics that adorn the Santa Cruz Tiger Shark Skateboard. It proves that Santa Cruz Skateboards, after all these years are still industry leaders when it comes to creativity and design. It is important to remember however, that this is a cruiser skateboard, so it isn’t built for doing the same standard tricks that a normal skateboard would be, so if you are planning on doing a lot of wicked kick flips and gleaming the cube, this probably isn’t the right skateboard for you. The Santa Cruz Tiger Shark skateboard is more meant for cruising down the street, slicing in and out and treating the pavement as if you were on a surfboard in the water, and in that respect it succeeds admirably. The large wheels ensure that sticks, twigs and pebbles won’t get in your way and send you flying off of the board if you hit one and the bearings while standard still allow for a very fast and smooth ride. While the wheels are big, they do feel a bit soft so you may find yourself thinking about upgrading them sooner than later to a more durable type. The trucks initially ship tight, but not as tight as many other complete skate decks do, so you can loosen them to your preference but for the most part they are just right. It is important to remember that this is a cruiser deck, so take that into consideration before you purchase. If your style is more street skating, then you might want to consider a more contemporary deck. 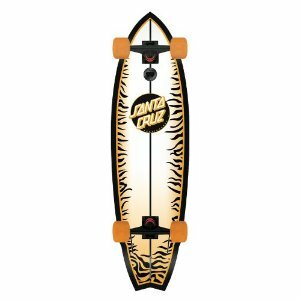 If you want to cruise though, the Santa Cruz Tiger Shark skateboard is a great option and with 20% off the RRP on Amazon at the time of writing, you’ll struggle to find a Santa Cruz board that is cheaper. This entry was posted in Reviews, Santa Cruz, Skateboarding, Skateboards and tagged Santa Cruz, Skateboard, Tiger Shark. Bookmark the permalink.